I have so many students working on sequencing and describing pictures in sequence. I am constantly looking for new ways to target this, as my students sometimes quickly learn my pictures, and it is not longer a challenge for them. 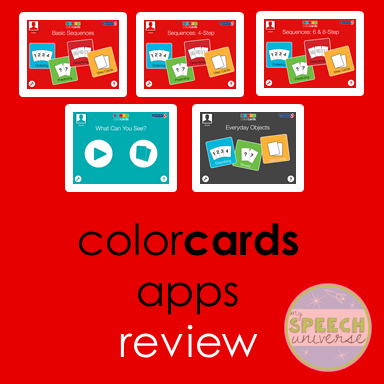 When I found out about Colorcards Apps, I jumped at the chance to check them out and review them! These are five great apps focus on using real-life pictures for sequencing, predicting, and describing. The apps are engaging, and lead to some great descriptions and stories! Basic Sequences App: This one has three pictures for students to sequence. 4-Step: This app has four pictures that students sequence. 6 & 8 Step: This app has six and eight step picture sequences. Ordering: students move the pictures around in to the correct order. There is an option for recording on this part of the app, however when the students put the pictures in order, the pictures flash with transparent color, which I find a bit distracting while trying to describe. Predicting: students guess what will happen in the last picture. Students can record on this activity. There is no correct answer picture provided. The therapist will judge whether or not the prediction is correct. Describing: students describe each picture, and can record their voice. This is my favorite part of these apps! It is great to have students listen to what they recorded, and fix anything if needed. When they are finished describing each picture in the sequence, it gives them an opportunity to listen to what they recorded in any order. My students LOVE to record themselves and then listen to each picture. This is a great opportunity to talk about what they recorded, and how they could change it if needed. View Cards: students are able to look at all of the pictures in a sequence and describe to you. There is not a recording option on this portion of the app. In the first three activities, there is an opportunity for the therapist to record data. This is all kept for each student, and graphs are available for the data. The remaining two apps, What Can You See? and Everyday Objects target describing and inferring skills. What Can You See? Students touch the picture, and a small amount is revealed with each touch. Students must infer what is going to appear. They can then describe it. There is a recording function on this app. Everyday Objects: Students are asked to describe a variety of pictures. The recording function is included in this app. Students can describe a sequence, or describe pictures as they are revealed (similar to the What Can You See? app). I have been using my EET beads with this app, and students are able to record their responses. This gives us a great way to discuss what else students could add to their descriptions. What do I like about these apps? My students really love these apps! There is a nice variety of pictures and sequences. I'm sure my students will eventually memorize some of the pictures, but that happens with a lot of sequencing cards, so really it is nice to have a new set to throw into the mix. I really love the recording function. My students have loved recording themselves and listening back. It has created so many great moments for self-correction. They are so proud of themselves when they work hard to create a story, and then are able to listen to the whole thing. My students also really like the pictures in the What Can You See? 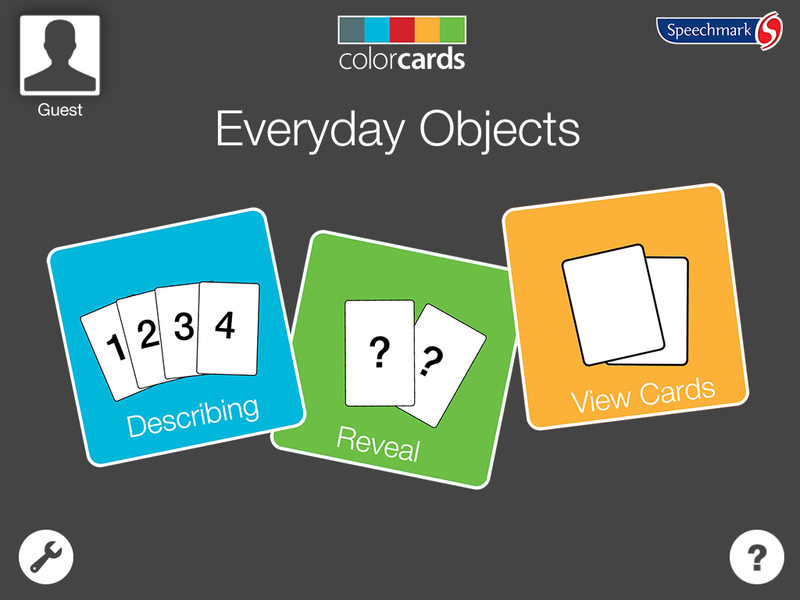 and Everyday Objects apps. They like to reveal piece by piece and figure out what the item is before it is fully revealed. What would I love to see? The only thing that bothered me was in the sequencing activities. I wish that the page would not flash colors. It is distracting to my students when they want to describe the sequence that they built. There is, however, another place for them to describe the exact same pictures, so really, it is not a big deal. Now that you know how much I love these apps, how about a chance to win ALL FIVE!?!? Colorcard apps is giving away all 5 of their apps to one lucky winner! All you have to do to win is enter below. This giveaway will run through Friday, May 15 at 11:59 pm (EST). I've used real Color Cards for years! This is so exciting!